When Kyle Abbott (Michael Mealor) jokingly told Summer Newman (Hunter King) he would do anything, including marry her, if she donated part of her liver to Lola Rosales (Sasha Calle), did anyone really think she wouldn’t take him up on his offer? The Snowflake has always been desperate for attention (wouldn’t you be if you had Phyllis for a mother?) but to marry a man who is clearly in love with someone else? That’s taking pathetic to a whole other level. Yes, Kyle got down on one knee and proposed to her in front of a crowd at the Athletic Club. But if he actually goes through with it, then he’s just as crazy as Summer. Here’s hoping Kyle grows a pair and reneges on her offer the moment Lola recovers. Meanwhile, Sharon’s (Sharon Case) lawyer Brittany Hodges (Lauren Woodland) called Rey Rosales (Jordi Vilasuso) to the witness stand during the J.T. murder trial and boy did he have a lot of explaining to do. She asked him why he showed up at Sharon’s door on Valentine’s Day to tell her he loved her. Was he trying to coerce her into a confession? Rey tried to avoid answering the lawyer but admitted, in front of everyone, including his seething wife Mia (Noemi Gonzalez), that he truly does love Sharon. Back at their apartment, he said to Mia that he told the truth in court and she was hypocritical enough to accuse him of cheating. Rey rightly pointed out she was the one who cheated on him, and with his own brother no less. Then he told Mia their marriage was over and walked out. 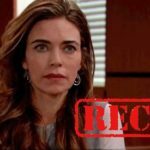 Rey’s testimony not only damned his marriage, but also seemingly damned Sharon, Victoria (Amelia Heinle) and Nikki (Melody Thomas Scott) as well. Seeing no other alternative to help his clients, Michael Baldwin (Christian Le Blanc) put Victoria on the stand. She described the hell J.T. (Thad Luckinbill) put her through and what happened the night of his murder. But will her gripping testimony help the three women or hinder them? In her cross examination, Christine Williams (Lauralee Bell) showed little sympathy for Victoria. Does anyone else feel the character of Christine is very one-dimensional these days? Writers seem to forget that Christine herself was abused back in the day. Let’s hope when her husband Police Chief Paul Williams (Doug Davidson) returns to Y&R they will occasionally show her outside of a courtroom setting. Just seeing her and Paul out to dinner at the Athletic Club would be a welcome relief. It looks like this week, the verdict for The Coven will be in. Do you think the three women will be acquitted, or will they be sent to jail?